Fallow Deer as a species are perhaps the most common "exotic" species found throughout the world. They now inhabit almost every country both in managed populations as well as in wild herds. 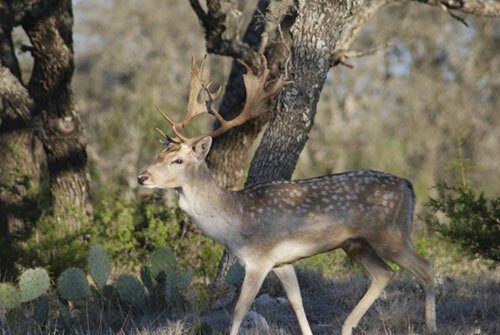 The Fallow Deer population in Texas is significant, however the counties in Central Texas in what is know as the Hill Country have the most numerous managed populations. Escondido Ranch, with its ideal habitat for Fallow Deer makes it an ideal hunting spot for those wanting a trophy animal. The Fallow Deer is medium in size with a long, rectangular shaped body and a longer neck with a pronounced larynx. The antlers on a mature buck are palmate, and will measure up to 39 cm in length and up to 25 cm in width at the widest point. Until about three to four years of age the males have straight antlers with points, which are shed every year. 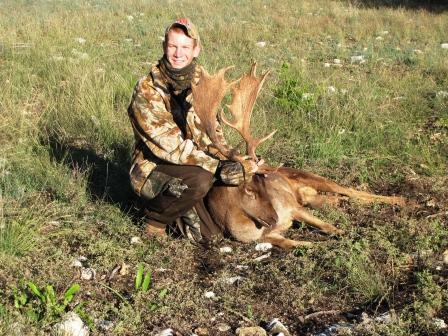 Only mature males develop the palmate set of antlers that are ideal for head mounts or antler mounts. Bucks do not using reach full maturity until about 6 years of age with females able to reproduce sometime after eighteen months to two years of age. Carefully management of herds ensures that there is a constant population that enables herd managers to ensure hunting opportunities well into the future. The lifespan of the Fallow deer is up to 15 years in the wild. The colors vary on the Fallow Deer based on the species and the crossing between subspecies within the Fallow Deer group. The most common coloration is the reddish brown rust color body with white belly and rump. There are small white spots running in rough lines horizontally down the body, with the spots blurring into lines closer to the belly. They have a black dorsal stripe that goes from the neck to the tip of the tail. During the winter months the heavier, thick coat is less distinct in its coloration. 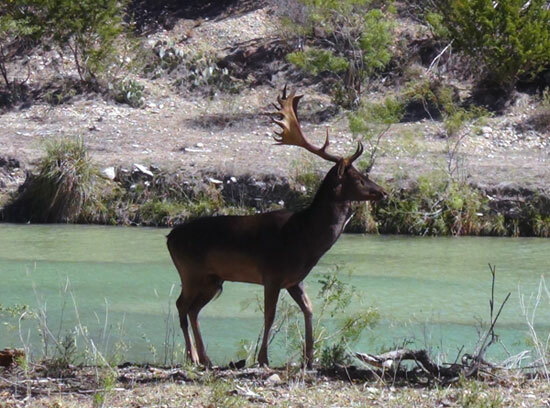 Menil, which is one of the most common colors in Texas herds, is the same as the common coloration only the colors are lighter, the body is tan and the dorsal stripe is dark brown. 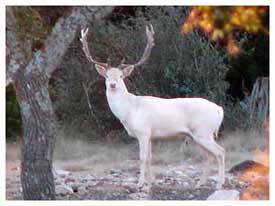 Texas herds can also contain white and black Fallow deer. 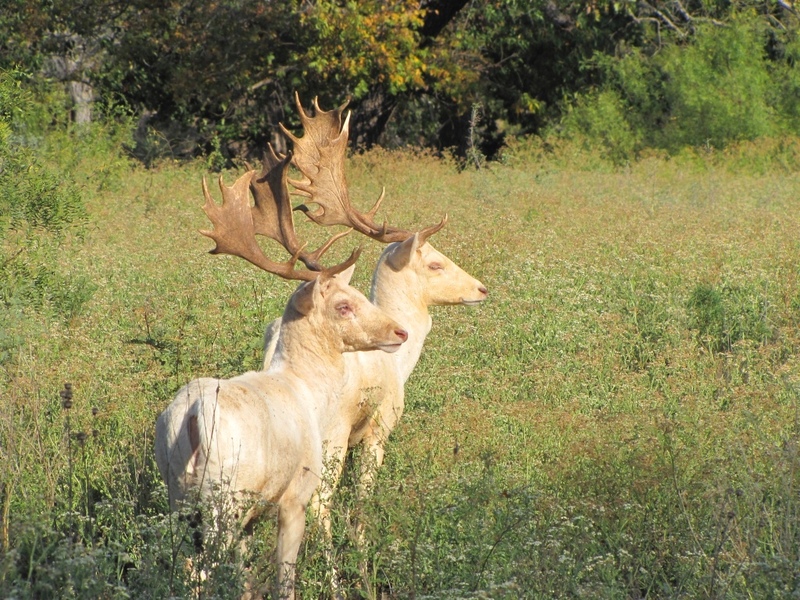 White Fallow deer are a unique and very distinct coloration that is not albino but a true white coat pattern, and are numerous on Escondido Ranch. Fallow deer prefer to feed on open, grassy areas and then take cover in moderate to dense forests and thickets during the bright afternoon hours. They will eat browse and young brushes and trees and are a highly adaptable species. They are often found just inside coniferous or deciduous forests or thickets and this is where some of the most productive hunting is done. The unique natural landscape and vegetation found on the Escondido Ranch makes a perfect habitat for Fallow Deer and the results of hunts definitely prove this beyond a doubt. Fallow deer venison is excellent, which is one reason they are raised worldwide.